Over the past couple of months, I have taken on a commissioned painting which takes an Angel as it's subject. This painting is large: just under 9' high and 6' wide.... large enough that I am painting it on-site. During in-depth interviews with the client and a couple of hundred pages of study on the subject, we came up with a direction and I had some imagery formulated in my head. Angels, according to Judeo-Christian tradition, are messengers and beings of light. The word "angel" itself comes from the Greek and Hebrew words that mean "messenger". Through my studies, I came up with keywords that helped me characterize some visual qualities of Angels: light, fire and movement. In the Bible they have always been portrayed like men, while our visual heritage through centuries of painting shows them with wings. It is interesting to note that up until the forth century, angels weren't shown with wings, and then the first paintings show them with black or dark wings like birds. 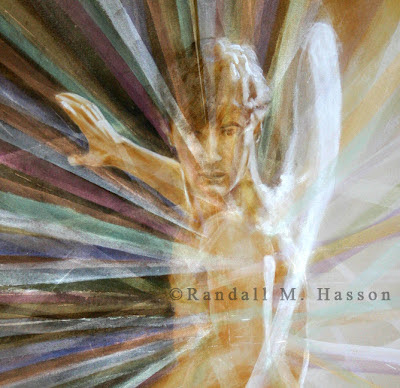 For this painting, the client had a specific vision of an angel in action. One of her keywords for the painting was protection... a warrior angel protecting his charges and taking care of God's business. She was looking for the angel in a specific act... the Angel was going in one direction when suddenly it sees someone that needs help... the moment is of a change of direction in mid flight. This Angel was to have white wings. The painting process is an interesting one, and working closely with a client on-site poses great opportunities for debate, stimulating conversation, brainstorming, and also opportunity for creative conflict.. After a couple of weeks, we had a discussion about the direction I was taking visually. At this point in the painting, what she was looking at and where I was going seemed to be two different emphases. I am attempting to create a painting of a being of light. Her desire is that I capture the intent of that specific moment. I realized that in this instance, she was reacting to what was on the canvas in front of her, while I was painting what I knew it was going to look like in a month. I could see the end result but she wasn't able to see where I was going. Moments like this are defining moments in a project, and sometimes a career. She asked me to change what I was doing, and I was going to comply... it is her painting after all, on her wall, and she was paying me to create something for her. I was at a point where I was contemplating rolling up the canvas and starting over on a new one... one that I knew would be beautiful but that wouldn't have the magic I originally saw. I would just take this one back to the gallery and finish it there the way I knew it was 'supposed' to be. I am fortunate to have a client however, that is sensitive and has seen enough of my work to have faith and trust in the process of the painting and the workings of the Spirit. She called me the next day and asked me to continue with my vision... she would trust that the outcome would be born of the Spirit. It was also an excellent point within the painting process; she was able to clarify for me that the intent of the figure was the key for her, but she realized that her vision would be different from mine. Below are images of the progression of this canvas. With respect to the light rays, it is probably somewhere between 30% and 50% done... with the layering techniques I use, I expect the figure to be painted, then light painted through, and the figure again repainted. This has already happened a couple of times, and could occur multiple times as the process continues. The layers and light are important elements, and my goal is that as a viewer moves through the room, the reflective properties of the interference and pearlescent paints I am using will change and move with each step, both from within and without the figure. With the layering, the viewer will literally be looking through the glazes, making for depth in the movement of light as well. The image that I am painting comes from my belief that if we were to see angels as they really were, spiritual beings, they would be a glittering and glorious sight to us that would leave us in awe, or fear and trembling. Since light is made up of all colors, this piece will have to have an array of color/light as well. Painting a subject like this leaves one to contemplate: if Angels are said to be the lowest order of God's created beings, then they are merely a dim reflection of the glory of He who is actually "clothed in light". Quite a thought to try and get one's brain around.